You thought the idea of Amazon’s drone delivery is bizarre? People can shoot at it and it’s gone? It is really not all that simple. 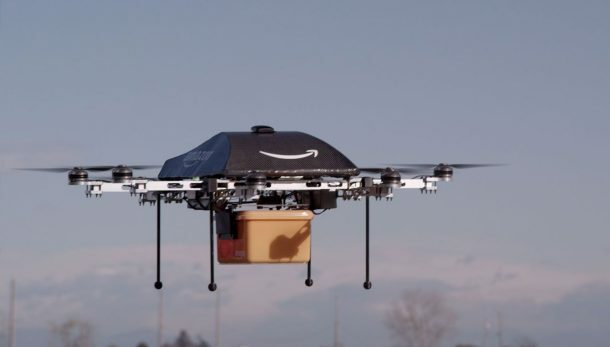 Amazon has filed a patent with the US patent and trademark office, documenting a technology for the protection of unmanned Amazon Drones. The idea is to create a mesh network of drones. The drones in the network will communicate location data with each other. In case proper data is not received from a drone, it is assumed that there is some trouble and required actions can be taken. A ‘fail-safe mode’ can help the drone land in a safe location with other drones providing surveillance. If something is thrown at the drone, the fail safe mode allows it to take evasive maneuvers and navigate to safe landing or parking zone for inspection. The drones are smart, equipped with proximity sensors to detect foreign objects. The sensors use all kinds of detection, like sonar, radio frequencies, optical, acoustic etc. The drones are not bullet proof, but in case you are thinking of knocking them down with a bullet, don’t. The technology allows Amazon to keep an eye on perpetrators, with other drones keeping track of it. The location data can allow an Amazon employee to go and retrieve the drone. In case of such an incident, the local authorities with be alerted and small crash landing airbags can be deployed. The idea of having your packages delivered by a drone is super exciting, but knowing of a sky full of drones carrying your personal information is scary. We may end up having drones that can exactly predict our shopping choices. Shooting a drone out of the sky is definitely not the best idea to keep your information safe though.